The Anderson Valley, of which Boonville is the largest town, was an isolated farming, ranching, and logging community during the late 19th century. There are several differing versions as to the origin of Boontling. Some assert that the jargon was created by the women, children, and young men in the hop fields and sheep shearing sheds as a means of recreation, and that it spread through the community as the children continued using it when they grew up. Myrtle R. Rawles explains that Boontling was started by the children of Boonville as a language game which enabled them to speak freely in front of elders without being understood. It is believed that the jargon originated from Ed (Squirrel) Clement and Lank McGimsey, in or about the year 1890. Based on interviews of family and neighbors, Rawles wrote an article, Boontling, or the strange Boonville language, which was published by the California Folklore Society in Western Folklore, volume 25, in 1966, and again by the Mendocino County Historical Society in 1967. Researcher Charles C. Adams studied the lingo in the 1960s and wrote a doctoral dissertation based on his research. 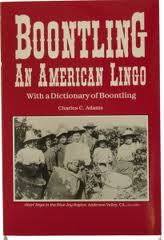 In 1971 University of Texas Press published his book, Boontling: an American lingo, which included an extensive dictionary. Boontling briefly enjoyed a national audience in the mid-1970s when a Boontling speaker named Bobby (Chipmunk) Glover was a regular guest on the well-known The Tonight Show Starring Johnny Carson on the NBC television network. Boontling historian Jack (Wee Fuzz) June appeared on the game show To Tell the Truth and was so well known by this point in time that panelist Kitty Carlisle had to disqualify herself from the judging. Because Boontling is a spoken jargon, rather than a written one, spellings of words vary greatly. Most spellings were not formalized until the 1970s, primarily by the writings of Jack (Wee Fuzz) June. For a list of the words spoken in Boontling click this link. This entry was posted in Mendocino History and tagged anderson valley, boontling, boonville, boonville language, california folklore society, charles c. adams, farming, jargon, lingo, logging, Mendocino, mendoicno county, ranching, to tell the truth, tonight show starring johnny carson, western folklore.